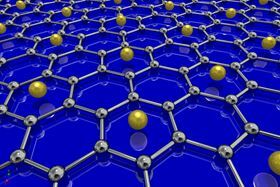 Graphene can be made superconducting by coating it with lithium atoms. Physicists at the University of British Columbia (UBC) have produced the first superconducting version of graphene, by simply coating it with lithium atoms. “Decorating monolayer graphene with a layer of lithium atoms enhances the graphene’s electron–phonon coupling to the point where superconductivity can be induced,” explains Andrea Damascelli, director of UBC’s Quantum Matter Institute and lead author of the paper in the Proceedings of the National Academy of Sciences (PNAS) that outlines the discovery. Although superconductivity has already been observed in intercalated bulk graphite – three-dimensional crystals layered with alkali metal atoms, based on the graphite used in pencils – inducing superconductivity in single-layer graphene has until now eluded scientists. “This is an amazing material,’” says Bart Ludbrook, first author on the PNAS paper and a former PhD researcher in Damascelli’s group at UBC. “Decorating monolayer graphene with a layer of lithium atoms enhances the graphene’s electron–phonon coupling to the point where superconductivity can be stabilized.” Analogous to photons, phonons are quasi-particles that represent the collective excitation of atoms or molecules in solid matter, and play a major role in electrical conductivity. The researchers, which include colleagues at the Max Planck Institute for Solid State Research through the joint Max-Planck-UBC Centre for Quantum Materials, prepared the lithium-decorated graphene in ultra-high vacuum conditions and at ultra-low temperatures (-267°C) to achieve this breakthrough. Given the massive scientific and technological interest, the ability to induce superconductivity in single-layer graphene promises to have significant cross-disciplinary impact, say the researchers. According to financial reports, the global market for graphene reached $9 million in 2014 with most sales in the semiconductor, electronics, battery, energy, and composites industries. This story is adapted from material from the University of British Columbia, with editorial changes made by Materials Today. The views expressed in this article do not necessarily represent those of Elsevier. Link to original source.